My research interests are diverse and include 1) using chemical and statistical techniques to understand migration patterns, habitat selection, and physiological responses of fish, 2) relating changes in water levels, streamflow, and water quality on aquatic ecosystem function, 3) fate and transport of sediment in the environment, 4) determination and application of streamflow statistics, and 5) use of hydroacoustic equipment in surface-water studies. Previously, I was a crew leader for the National Rivers and Streams Assessment (NRSA), a nationwide stream health assessment effort led by the USEPA. Currently, I am a crew leader for a NAWQA trends ecological site, and I am a member of the St. Croix Basin Water Resources Planning Team. I also am actively involved in the Rainy River/Lake of the Woods and Red River Basins. 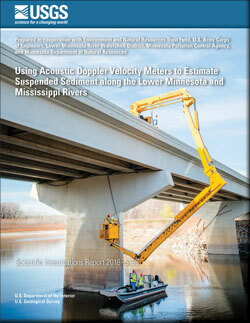 Recently, I have been involved in a USGS effort to coordinate USGS activities in the Mississippi River Basin and align USGS science priorities in the Mississippi River Basin with the needs and priorities of several partner agencies. 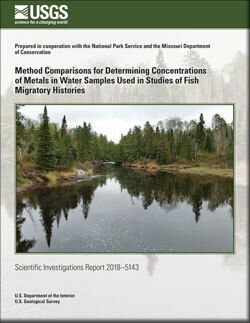 Partner agencies on my projects include Minnesota Pollution Control Agency, Minnesota Department of Natural Resources, International Joint Commission, National Park Service, USGS Upper Midwest Environmental Sciences Center, Missouri Department of Conservation, South Dakota State University, U.S. Army Corps of Engineers, Northern Arizona University, the USGS Grand Canyon Monitoring and Research Center, and the Legislative-Citizen Commission on Minnesota Resources. Cowdery, T.K., Christenson, C.A., and Ziegeweid, J.R., The hydrologic benefits of wetland and prairie restoration in western Minnesota: lessons learned at the Glacial Ridge National Wildlife Refuge, 2002-15: U.S. Geological Survey Scientific Investigations Report, in review. Magdalene, S., Johnson, D.K., Ziegeweid, J.R., and Kiesling, R.L., 2018, Report on the state of the lake: assessing Lake St. Croix in 2018 on the way to the 2020 TMDL Goal: Cooperator Report, 40 p.
Magdalene, SM, JR Ziegeweid, RL Kiesling, DK Johnson, DR Engstrom, and DS Hansen. 2013. Lake St. Croix nutrient loading and ecological health assessment. Final Report to the St. Croix River Association, 100 p.
Ziegeweid, JR, CA Jennings, DL Peterson, and MC Black. 2008. Effects of salinity, temperature, and body size on the survival of juvenile shortnose sturgeon. Transactions of the American Fisheries Society 137: 1490-1499. Ziegeweid, JR, CA Jennings, and DL Peterson. 2008. Thermal maxima for juvenile shortnose sturgeon acclimated to different temperatures. Environmental Biology of Fishes 82: 299-307. Ziegeweid, JR. 2006. Ontogenetic changes in salinity and temperature tolerances of young-of-the-year shortnose sturgeon, Acipenser brevirostrum. MS Thesis. University of Georgia. 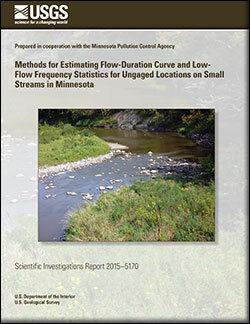 The USGS partnered with the Minnesota Department of Natural Resources to collect hydraulic and water chemistry data in the lower St. Croix River for development of a model that predicts the probability of successful egg hatching and survival of juvenile invasive carp over a range of water temperature and streamflow conditions. Sediment from the Chippewa River deposits in the Mississippi River navigation channel, sometimes disrupting commercial barge traffic and resulting in expensive and ecologically disruptive dredging operations. The USGS is using new applications of hydroacoustic technologies to better understand sediment transport in the Chippewa River and associated effects on commercial navigation. Groten, Joel T.; Ziegeweid, Jeffrey R.; Lund, J. William; Ellison, Christopher A.; Costa, Samuel B. ; Coenen, Erin N.; Kessler, Erich W.
Groten, J.T., Ziegeweid, J.R., Lund, J.W., Ellison, C.A., Costa, S.B., Coenen, E.N., and Kessler, E.W., 2019, Using acoustic Doppler velocity meters to estimate suspended sediment along the lower Minnesota and Mississippi Rivers: U.S. Geological Survey Scientific Investigations Report 2018–5165, 30 p., https://doi.org/10.3133/sir20185165. Ziegeweid, Jeffrey R.; Zigler, Steven J.; Maki, Ryan P.; Karns, Byron N.; Love, Seth A.
Ziegeweid, J.R., Zigler, S.J., Maki, R.P., Karns, B.N., and Love, S.A., 2018, Method comparisons for determining concentrations of metals in water samples used in studies of fish migratory histories: U.S. Geological Survey Scientific Investigations Report 2018–5143, 20 p., https://doi.org/10.3133/sir20185143. 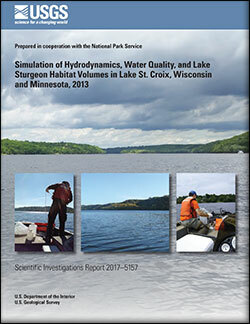 Smith, E.A., Kiesling, R.L., Ziegeweid, J.R., Elliott, S.M., and Magdalene, Suzanne, 2018, Simulation of hydrodynamics, water quality, and lake sturgeon habitat volumes in Lake St. Croix, Wisconsin and Minnesota, 2013: U.S. Geological Survey Scientific Investigations Report 2017–5157, 60 p., https://doi.org/10.3133/sir20175157. 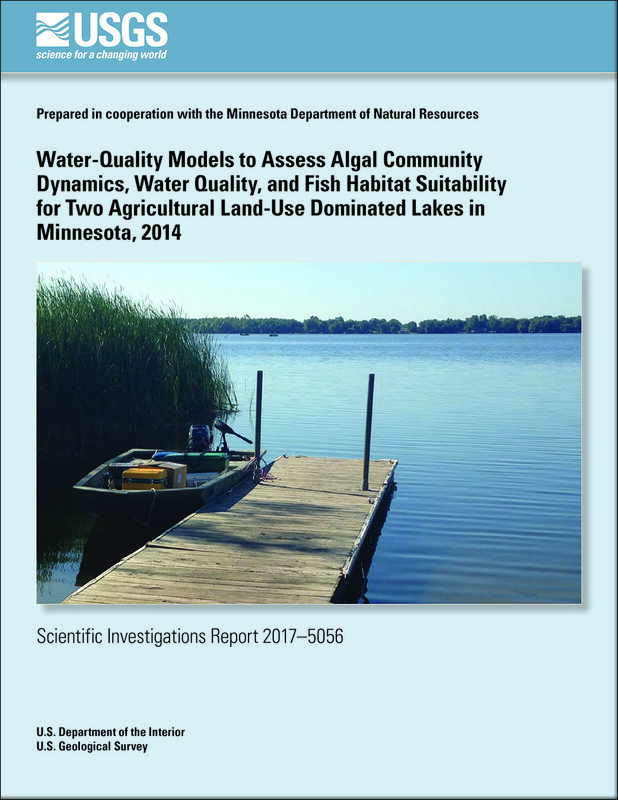 Smith, Erik A.; Kiesling, Richard L.; Ziegeweid, Jeffrey R.
Smith, E.A., Kiesling, R.L., and Ziegeweid, J.R., 2017, Water-quality models to assess algal community dynamics, water quality, and fish habitat suitability for two agricultural land-use dominated lakes in Minnesota, 2014: U.S. Geological Survey Scientific Investigations Report 2017–5056, 65 p., https://doi.org/10.3133/sir20175056. 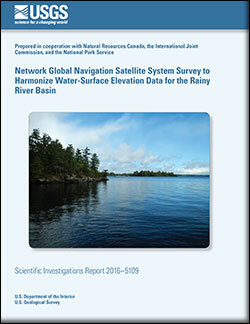 Ziegeweid, J.R., Silliker, R.J., Densmore, B.K., and Krahulik, Justin, 2016, Network Global Navigation Satellite System survey to harmonize water-surface elevation data for the Rainy River Basin: U.S. Geological Survey Scientific Investigations Report 2016–5109, 20 p., http://dx.doi.org/10.3133/sir20165109. 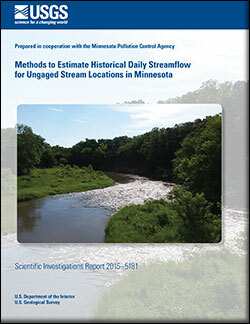 Lorenz, David L.; Ziegeweid, Jeffrey R.
Lorenz, D.L., and Ziegeweid, J.R., 2016, Methods to estimate historical daily streamflow for ungaged stream locations in Minnesota: U.S. Geological Survey Scientific Investigations Report 2015–5181, 18 p., http://dx.doi.org/10.3133/sir20155181. Ziegeweid, Jeffrey R.; Lorenz, David L.; Sanocki, Chris A.; Czuba, Christiana R.
Ziegeweid, J.R., Lorenz, D.L., Sanocki, C.A., and Czuba, C.R., 2015, Methods for estimating flow-duration curve and low-flow frequency statistics for ungaged locations on small streams in Minnesota: U.S. Geological Survey Scientific Investigations Report 2015–5170, 23 p., http://dx.doi.org/10.3133/sir20155170. 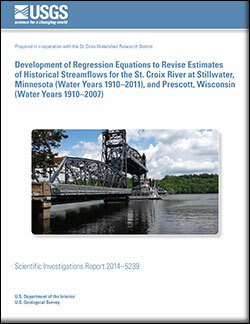 Ziegeweid, J.R., and Magdalene, Suzanne, 2015, Development of regression equations to revise estimates of historical streamflows for the St. Croix River at Stillwater, Minnesota (water years 1910–2011), and Prescott, Wisconsin (water years 1910–2007): U.S. Geological Survey Scientific Investigations Report 2015–5239, 23 p., http://dx.doi.org/10.3133/sir20155239. 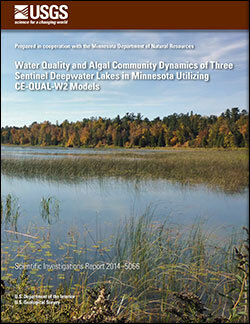 Smith, Erik A.; Kiesling, Richard L.; Galloway, Joel M.; Ziegeweid, Jeffrey R.
Water quality and algal community dynamics of three deepwater lakes in Minnesota utilizing CE-QUAL-W2 models; 2014; SIR; 2014-5066; Smith, Erik A.; Kiesling, Richard L.; Galloway, Joel M.; Ziegeweid, Jeffrey R.
Densmore, Brenda K.; Strauch, Kellan R.; Ziegeweid, Jeffrey R.
Hydrographic surveys of four narrows within the Namakan reservoir system, Voyageurs National Park, Minnesota, 2011; 2013; DS; 792; Densmore, Brenda K; Strauch, Kellan R.; Ziegeweid, Jeffrey R.